I have a confession. I love baskets. More specifically, I love Longaberger baskets. I have several boxes full of them that I should take out of storage and display. 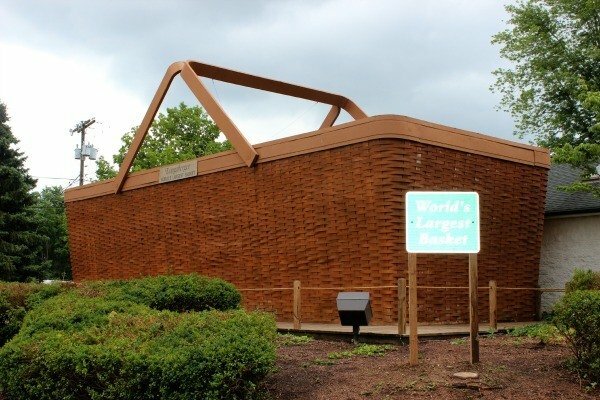 And if you’re a Longaberger basket fan and you find yourself in Ohio, you really shouldn’t resist a stop at what is the World’s Largest Basket in Dresden. 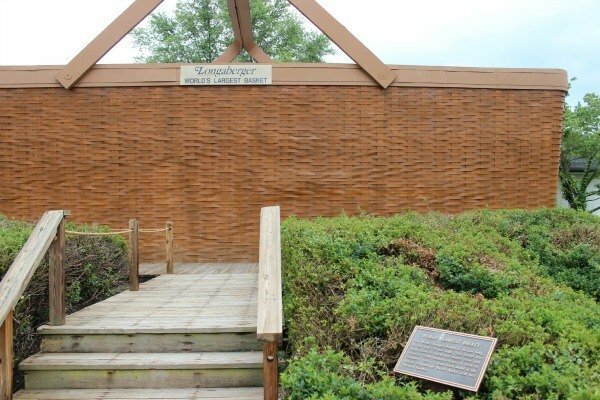 This house-sized basket, which is prominently displayed on the corner of Main St. and W. 5th St., took 10 maple trees and 2,000 employee hours to complete in 1990. The basket who many call a picnic basket is actually modeled after Longaberger’s popular Market basket. 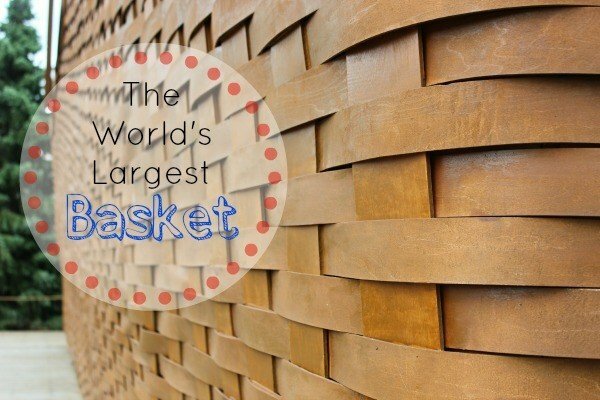 The dimensions of the basket measure 48 feet long, 11 feet wide and 23 feet high. 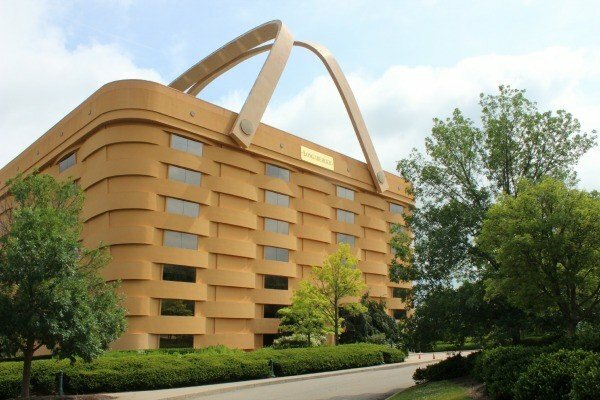 While this basket is pretty impressive, it shrinks when compared to the 7-story-tall building that once served as Longaberger’s headquarters in nearby Newark. The large basket building is also a medium-sized Market Basket. The 185,000 square foot basket sits on 21-acres along State Route 16 and is easily visible from the road. The building originally cost $30 million dollars to build. I wasn’t content to drive by and not get a closer look. I photographed the building from the right and left and drove into the parking lot to get a better look. I would love to have stepped inside the lobby when it was open to get a view of the glass atrium and hope whoever purchases the building (yes, it’s for sale folks) restores it and permits visitors. 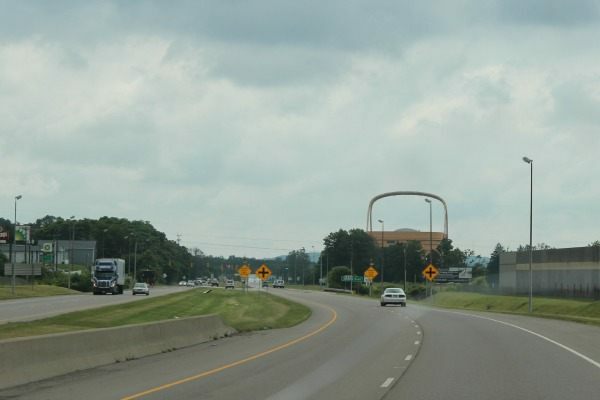 I had also planned to stop at the Longaberger Homestead in Frazeysburg to photograph the World’s Largest Apple Basket. Unfortunately, I discovered that I didn’t plan our visit well since the Homestead was actually closed on the day we stopped by. I admit, I was more than a little bit disappointed but now I realize that just gives me a reason to plan a road trip on another day. Planning a road trip and looking for more attractions like this? Check this out—–> Over 50 Roadside Attractions in the United States. 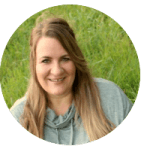 © 2013 – 2019, Tonya Prater. All rights reserved. I’ve been to Longerberger at least four times-crazy,I know, especially since I live in Hawaii ! It’s amazing to see off the 16–we have nothing like that here! But, I do love living in the Hawaiian Islands, blue ocean, green trees, cool breezes. I’m crazy for Longaberger baskets-I bought one today, in fact! Hi Tonya ! I work for a legacy airline, so sometimes I get crazy ideas and just pick up and fly just about anywhere I want to go. But, on the other hand, I live in Hawaii and the last time I ventured into Waikiki was more than a year ago to attend an event in a nice hotel. Nice meeting you! Aloha ! I have some of pottery, but would rather have a warm brown basket, but am not too keen on round shaped ones. That is really, really impressive! I would love to see that in person! 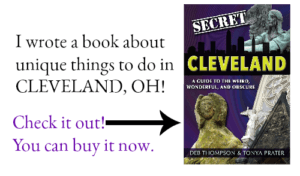 I loved seeing the huge basket, but then I love fun and quirky attractions like that! I loved seeing it. I’ve heard about the basket for YEARS. I can’t believe it took me that long to see it- especially with my obsession of roadside attractions! I have a basket that looks similar to this but had no idea it had a name. Ingenious. I don’t read architectural plans but I bet these plans would be interesting to see. Wonder what the local agency thought when they saw it. It is a great conversation piece, isn’t it? wow how bizarre, you can’t forget a building like that once you’ve seen it! I have one little Longaberger basket. They’re so pretty but oh so expensive. 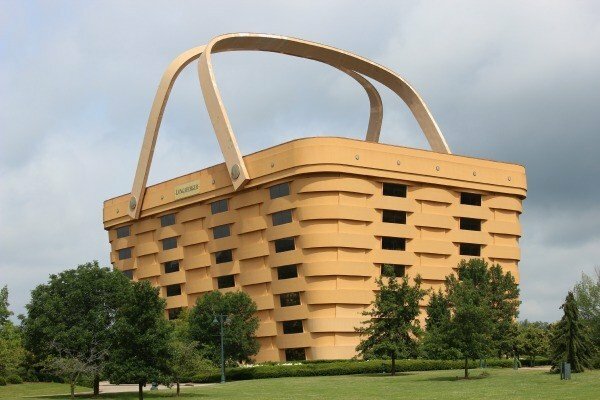 I’ve heard of the headquarters building that looks like a basket but ths is the first I’ve heard of the house-sized wooden one. It’s more impressive than the headquarters if you ask me. Do they sell the baskets at the headquarters or do you still have to get invited to a Basket Party? Many of my baskets are what they call seconds. I was able to pick up a few from family members who used to work at Longaberger. I’m not sure if they sell the baskets at the headquarters since we didn’t go in. I know you can buy retired baskets and accessories in Dresden and more baskets at the Longaberger Homestead. There are still Longaberger parties, but they also have stores popping up that sell the baskets. Last week I saw a small selection in our local Kroger grocery store! They use to have a basket that you could only buy at the headquarters when we were there for a tour. They also had baskets that you could only buy at the homestead. You could also make your own basket. There were a few different designs to chose from that you make. It’s been a while since I was there last so things may be different now. I didn’t know they had a basket at headquarters. I wonder if they still have one. The Homestead was closed when I visited but I’m hoping to make another trip to the area to check it out. Tonya, you are always answering questions I didn’t even know I had 🙂 Definitely a kooky stop, but a great one! Oh my goodness. That is amazing. It would definitely stop you in your tracks!